The beauty of this world is evidence of a Great Intellect who orders all things to himself. An example taken from art can help us see this. We look at beautiful artwork in one of two ways: either in itself (horizontally), or in relation to its artist (vertically). 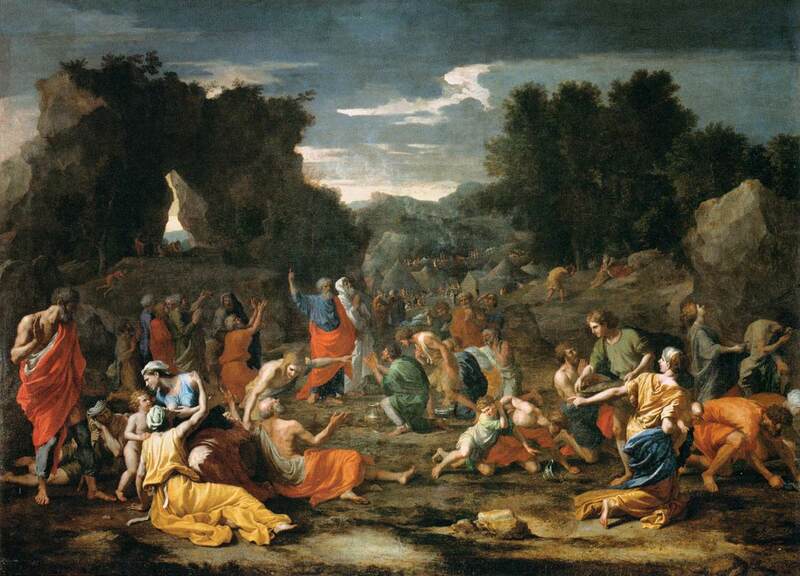 To look horizontally at Nicolas Poussin’s Israelites Gathering Manna is to appreciate the balance of its composition, the harmony of its colors, the depth of its meaning, and the perfection of its mathematical proportions. However, we look at it vertically when we seek to understand what the work tells us about Poussin. Looking at the painting alone and knowing nothing else about the artist, we can nevertheless deduce that the creative intellect behind it was incredibly rational, methodical, and precise, which was indeed the case with that Baroque genius. The same goes for the beauty of Earth, which is a complex and amazingly fine-tuned reality. As Eric Metaxas points out in his recent book Miracles, the very fact that our planet can support life is itself a sort of miracle given the incredible amount of necessary conditions and the infinitesimal margin of error allowed for each. If Earth were just slightly larger and had just slightly more gravity, toxic gases such as methane and ammonia would remain too close to the surface for life to be possible. If Earth were just slightly smaller, water vapor would dissipate leaving a virtually waterless planet. If it rotated just slightly slower, our nights would be too cold and our days would be too hot. If it rotated just a little more quickly, winds would reach insupportable velocities. Metaxas mentions many more requirements and only just scratches the surface. The Earth and all that it contains overflows with so much perfection, harmony, and splendor that a vast number of sciences are dedicated to studying it. Through geology, meteorology, ecology, zoology, and so many other disciplines, we grow in our knowledge of the Earth’s beauty and come to appreciate it horizontally. However, marveling at the amazingly precise calibration of this beautiful planet, it is almost impossible not to ask why and how it is so perfect; it is almost impossible not to consider it vertically. If Earth is so fine-tuned, there has to be a Fine-Tuner. Just as the perfection of Israelites Gathering Manna points to the creative genius of Poussin, so the super-abundant perfection of Earth points to the super-abundant creative genius of its Maker. To say that Earth came together randomly would be like saying that Poussin’s masterpiece came about from a random spilling of paint. The beauty of Earth points to the Great Artist who is behind it.